Operation Diver is the story of a battle: its action, people, landscapes, and remains. The battle was Anti-Aircraft Command’s attempt to defeat the V1 flying-bomb, the first of Nazi Germany’s ‘retribution’ weapons, whose attacks dominated the home front in the final year of the Second World War. Beginning in the week of D-Day, the flying bomb battle lasted for nine months. In that time the men and women of AA Command became a massed, mobile army, shifting a vast carpet of guns to meet the V1’s changing lines of attack. Beginning in Kent and Sussex, their journey took in the Thames Estuary, East Anglia and eventually the Yorkshire coast. Along with the RAF’s fighter aircraft and the larger air defence system, their mission was to prevent a single flying bomb from reaching London, or any other British city. The battle was won; but not before many technical and human obstacles were overcome. 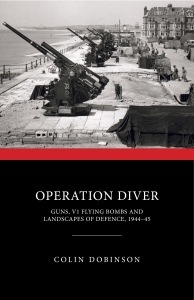 Published to mark the 75th anniversary of the flying bomb campaign, Operation Diver is also an essay in landscape history, and shows for the first time in detail how hundreds of guns and thousands of gunners were deployed across the fields and farms of Britain, from the south-east to Flamborough Head. Published with a full gazetteer of gunsite positions, it also documents Historic England’s work in assessing the survival of Operation Diver’s fragmentary remains.